By the way, I was so blown away by all the incredibly sweet feedback on this post from a few weeks ago. You have all been such an encouragement to me and it really has meant the world. If I happen to have any more problems with PPD or need advice of any sort, I know I have an amazing support group to turn to. I’m so thankful for you all! Congrats, my love! I’m so excited for you! P.S. Once Jack makes his appearance, can I come visit? I miss youuuuuu. So so so thrilled for you. Yay for mommy dates! I CAN’T WAIT TO “MEET” HIM!!! hahahaha..sometimes I take 2 hour naps with my babe..lol..on our good days where we have nothing to do..sometimes it’s needed! woo hoo for being able to stay with your babies! I was seriously sleeping all the time a few weeks ago. It was Lind of ridiculous how tired I was all the time. You are in third tri, it is allowed. Growing a baby is a lot of work. :) since I started taking a B vitamin complex though my sleep needs have greatly decreased, it is amazing! Well anyway, congrats to you! I’m not sure I can like you anymore after seeing how good you still look. I’ll try my best. On a totally unrelated note can you do a little tutorial on how to make one of those chrysanthemum (yes, I definitely had to google how to spell that) looking flowers on your yarn wreath below. I’ve already mastered the rosette and bow thanks to you. Oh and Kristy, I'm going to have to start taking them in MY ghetto apartment bathroom. Fun times. At least I only have to do it 4 or 5 more times? I hope? Oh my! 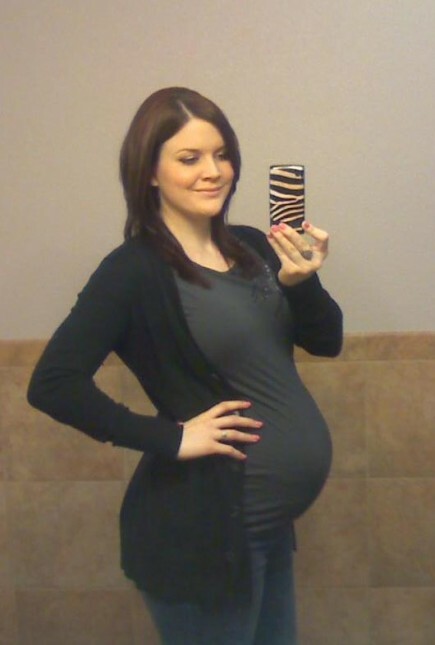 You are the cutest pregnant woman I’ve seen lately! Your baby bump is adorable, congratulations for such blessing! yay! STAY AT HOME MOMMY! Congrats on officially being a stay at home mama! You’ll have to do bathroom photo shoots from the comfort of your own home now! :) You look beautiful! Can’t believe you’re already at 9 months! Hi there! I found your blog randomly during a Google search and I just love it! I’m so glad I found it and I look forward to following along! I hope you will still share weekly belly pics with us the next few weeks till the baby is born. I can’t wait to “meet” Jack via the web. :) Congrats and relax! ok, seriously! you are more stylish at nine months pregnant than i am not pregnant at all! not fair! congrats on becoming a stay at home mom! You are all baby belly and I love it! It was so fun to see those bathroom pics each week, and it will be even better when Jack makes his arrival! You look so tiny, good luck and enjoy the time with your sweet little girl and get all the rest you can. I look forward to following your blog after your little miracle is here also.